However, their strength is important for all, especially for the ones who lead a sedentary lifestyle or their job involves sitting for most of the time. If you manage to strengthen the core, you will improve the body posture, support the spine and avoid pain. Most of you are probably unaware of the fact that core exercises do not only include exercises for the abdominal muscles. These exercises also engage the back muscles and the glutes in order to support the spine with the entire body. This is also advisable for people who are top-heavy and often strain their back. Yet, these exercises are far more physically engaging and mentally stimulating than the tedious sit-ups. When it comes to strengthening the core, the most beneficial exercise you can do is the plank. Planks offer numerous health benefits despite strengthening the abs, as they improve the mood, enhance your flexibility, provide stamina, and relieve back pain. Yet, initially, doing these exercises may be quite a challenge, as they engage more muscle groups at the same time. However, after finishing the 28-day challenge, you will have significantly toned the core muscles, reduced belly fat, and improved your posture! The most important thing in doing planks is to maintain the right position. In his video, Scott Herman Fitness explains how to do planks correctly. 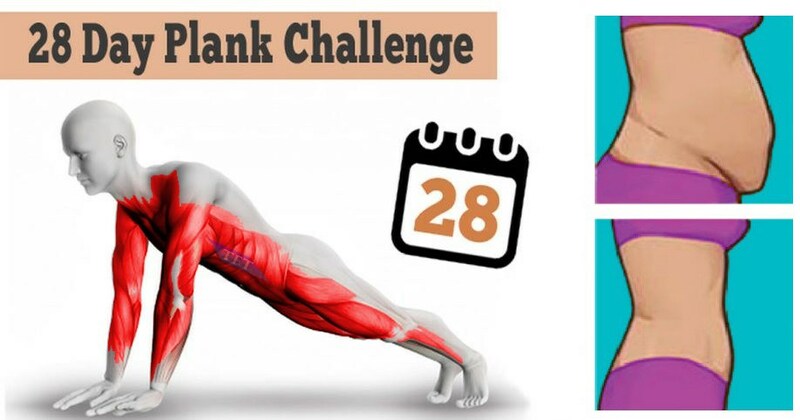 This challenge will slowly increase the intensity and difficulty levels, by prolonging the time for holding the plank position. Eventually, you should be able to hold it for 4 minutes. Yet, as you will regularly do the planks, you will gradually tone your core muscles daily. DAY 28 – Try to hold as much as possible.